BEIJING, April 16 (Xinhua) -- Ninety-two senior officials of the State Council took an oath of allegiance to the Constitution at a ceremony Monday. The ceremony was held in the Zhongnanhai leadership compound in downtown Beijing and overseen by Premier Li Keqiang, according to a State Council press release. The officials were appointed to 42 State Council departments from June last year to March, the statement said. 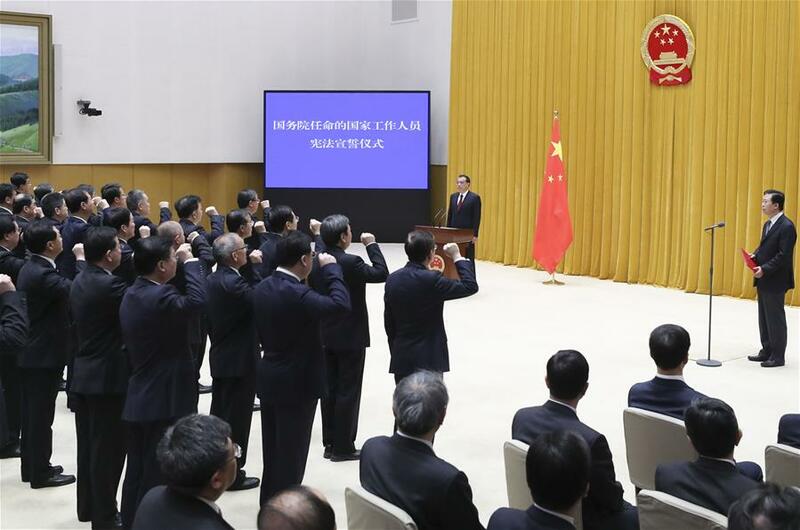 Xiao Jie, state councilor and secretary-general of the State Council, announced the beginning of the ceremony, at which officials sang the national anthem first and recited the oath. In a speech after the ceremony, Premier Li asked officials to "stay loyal to the Constitution, exercise their duties according to it and work with diligence and integrity." They were told to concentrate their effort on "development, follow the new vision for development, work for comprehensive progress of Chinese society, help improve people's welfare and solve their problems." Vice Premiers Han Zheng, Sun Chunlan, Hu Chunhua and Liu He, and State Councilors Wei Fenghe, Wang Yong, and Zhao Kezhi were at present.